Polyester can be found in the composition of different things. This synthetic material is made from polyester fibers and has many positive properties. The fabric, which is written 100% polyester, is rare. It is often added to the composition of another fabric in order to give the products strength, durability, elasticity. If cotton or wool is combined with polyester fibers, a material is obtained that is easily washable, does not stretch, and ceases to be subject to shrinkage. Polyester stitches for sportswear, swimsuits, light scarves, raincoats and winter jackets. They are durable and do not need to be ironed carefully. Despite all the advantages of polyester, sooner or later the question arises how to wash such clothes in order to preserve their flawless appearance for a long time. Before you wash things from polyester, you need to carefully examine the label on the clothes. It should indicate the maximum temperature that cannot be exceeded. Polyester does not shrink after washing, but can easily be deformed. If hard-wearing stains appear on synthetic clothing, do not boil it. With this you finally spoil the thing. colored powder suitable with the note "Color". If there are no other recommendations on the label, at what temperature to wash polyester, do not heat the water stronger than 40 ° C. Turn things inside out before soaking. This will save the front side from rapid wear. When rinsing, be sure to use air conditioning. It will remove statistical electricity, make the thing soft and soft. Synthetics are not prone to the appearance of hard-to-remove stains. If the contamination is fresh, hold the item under a stream of warm water, lightly soap and rinse. The material will be clean again. Old stains are good for removal too. In order to remove stubborn dirt before washing polyester, you need to wet the product, take a stain remover that does not contain chlorine, and pour a little on the stain. Wait a few minutes and rinse the fabric. Before the first use of the tool, it is desirable to test it on a small area of ​​clothing. To do this, soak a cotton swab with a stain remover and attach it to the wrong side of the thing around the seam. If no paint has passed on the tampon, but there is no light mark on the clothes, the product is colored firmly and the stain remover can be used. Dirty cuffs, pockets, shirt collar before washing is recommended to wet and gently handle with soapy water. If the stains are very persistent, try to get rid of them with salt. Apply a thick layer of salt to the wet contamination and leave for half an hour. Rinse off the salt with running water and start washing. How to wash 100% color polyester, if it has a lot of bright spots? Before washing, try to clean the dirt with borax and lemon juice. Get 10% borax at the pharmacy, soak a piece of cotton in it and process the stain with it. Pour water into a bowl of 200 ml, dissolve in it 1 tsp. citric acid and liquid moisten dirty marks. Instead of acid, you can use lemon juice. After a few minutes, rinse the item with water and wash it. Before loading things into the drum, do not worry about whether you can wash polyester in a washing machine. The fabric withstands automatic washing well, if you stick to small tips. Sort colored things from whites. Check pockets, zip and buttons. Thin fabrics should preferably be put in a laundry bag. Wash polyester in a washing machine is simple. Put things in the drum. Add necessary amount of detergent and conditioner. Select the mode of "manual" or "delicate wash." For sports things it is desirable to use the option "sport". If things need to be brushed with sweat, a “quick wash” will do. Spin must not exceed 800 revolutions. When washing thin polyester blouses and shirts, set the mode to less - 400-600 turns. Take out clean things, shake gently and hang to dry in fresh air, avoiding direct sunlight. Wrinkles rarely appear on clothing, so when it dries, it does not need to be ironed. If nevertheless the need has arisen, set the “silk” mode on the iron, turn the product inside out, put wet gauze on it and iron it carefully. 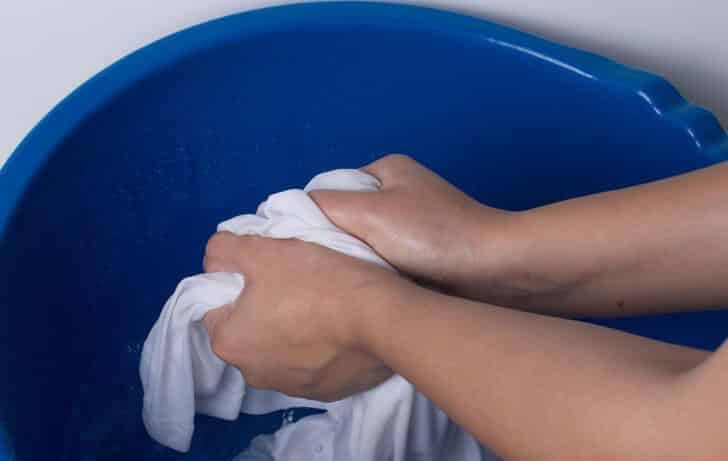 If you want to quickly refresh a T-shirt or sports shorts by hand, washing polyester does not take much time. Type in a basin of warm water, dissolve the powder in it. Use hand wash for hands washing. It foams well and does not leave soap stains. Soak dirty things on the 30 minutes, remember them gently with your hands, pour out water and rinse several times. Attention! Despite the resistance of the fabric to damage, it is not worth rubbing polyester strongly during the wash. He may lose an attractive look. Как wash winter jacket from nylon and polyester so that it does not lose presentable? Washing outerwear with insulation has its own characteristics. Raincoats and jackets can be machine washed. Before loading, check the pockets, turn the product on the wrong side and place it in the drum. Polyester jacket should be washed at a temperature not higher than 40 ° С. Choose "delicate mode". If the jacket filler is made of synthetic winterizer, use the “Villinka” or “Weasel” laundry detergent. To preserve the volume of the product, pour the conditioner cap into the tray. Press at minimum speed. So on a raincoat or a jacket there will be no creases. Dry on the balcony, hanging clothes on a hanger. If you wash the polyester jacket in the correct mode, you can not iron it. Thing perfectly retains its shape and does not wrinkle. When a natural feather appears as a heater for a winter thing, the question is how to wash a down jacket made of polyester in a typewriter machine. To prevent the item from deteriorating, select the “handwash” mode, pour liquid powder into the compartment and set the rinse without twisting. When the wash cycle is over, start the second rinse with the conditioner at minimum speed. Remove the down jacket, hang it on the hangers and dry in the fresh air. Every few hours shake the fluff so that it does not crumple. When the jacket dries, hang it with the hem up. So the product will keep the volume and shape. If outerwear must be washed by hand, a polyester jacket should be immersed in a bath of warm water. Before it it is necessary to pour liquid powder for careful washing. Thing is not required to soak. Rub the dirt with a soft brush, slightly squeeze the clothes and rinse the 3 times. Gently remove excess water and hang the jacket on a coat hanger for drying. In modern blankets, polyester is often used as a filler. Manufacturers of such products recommend cleaning them in dry cleaning, because when washing the blanket can lose shape. But what if professional cleaning is not possible? How to wash a polyester blanket? When the capacity of the machine is more than 5 kg, the blanket can be loaded into the drum, pour liquid detergent and conditioner, set the “delicate wash” program with a minimum of spin and include an extra rinse. Take out the wet thing and spread it out on a smooth surface. Do not forget to turn the product so that it dries equally from all sides. Wash a huge double polyester blanket in the bath by hand. Soak it on 10 - 15 minutes in a powder, rub with a sponge and rinse thoroughly with clean water. It is necessary to squeeze and dry, as well as when washing in the washing machine. Backpacks are often made from nylon and other synthetic materials. Since the fabric is different endurance, you do not need a long search for a way to wash backpack from polyester. If there are no leather inserts and large rivets on the sports bag, place it in the automatic machine, wash it in the “hand wash” mode, except for spinning, and dry it on the balcony. It often happens that the backpack is dirty with pens and straps, and the rest of the product is clean. In order not to wash the entire bag, dissolve the cap of the shampoo in a glass of water, foam and wipe the dirty handles with a toothbrush. Wash the foam with water and dry the backpack straps in the open air. A couple of times I looked like my wife is suffering with the washing of jackets by hand. It's horrible. But then I decided to buy UniPuh and made life easier for her at least in something.